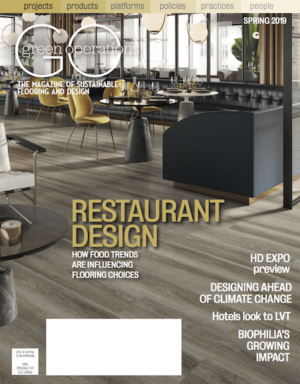 Export, Pa.—Karndean Designflooring invites hospitality designers, managers and hotel owners to see flooring differently May 2-4 at the company’s booth at HD Expo in Las Vegas. From the company’s original visuals to designability to ordering, Karndean Designflooring’s unique approach to luxury vinyl will change the way you design and specify hospitality flooring. Among the company’s 24 new Spring 2018 designs is Grey Riven Slate, which appears on the booth floor directly below a 300-pound piece of slate that inspired the design. Other new designs include American black walnuts, shuttered concrete, European oaks and pines, and Australian spotted gum. Each of the company’s three award-winning, waterproof formats—gluedown, loose lay and rigid core—allows designers to design flooring differently. By blending multiple products into one design, incorporating wayfinding and zoning, and the use of design components and inlays within the six gluedown ranges, designers can create a floor that both aesthetically enhances spaces and adds functionality. Guests will see the impact of Designflooring throughout the booth, from a grouted wood design to intricate blends, to a vignette of a hotel lobby seating area designed by Katelyn Von Tickner of sérendipité design studio. Karndean LooseLay’s multi-directional designs can be installed quickly and easily in any space with minimal adhesive and minimal disruption to guests and patrons. In addition, Karndean LooseLay allows for an easy transition to carpet tile, its planks and tiles may be individually replaced, and it reduces noise transfer by 13 dB. The company’s Korlok rigid core continues the Karndean Designflooring tradition of excellence in design and performance. While typical rigid core floors contain wood fillers or composites, Korlok’s waterproof, proprietary K-Core is composed of 100% PVC to ensure a stronger, more stable core for installation over most existing hard floors without exposing subfloor imperfections. Korlok’s pre-attached acoustic foam backing not only reduces sound transmission by 22dB, but retains its shape after being compressed, does not pool water or encourage the growth of mold, mildew or bacteria. Introduced in 2017, Korlok Select features the company’s HoldFast 5G locking mechanism, guaranteed to keep planks together at the end seams by its 15-year HoldFast Commercial Warranty, in a 56” x 9” extra-long plank and 20mil wear layer. An extension of the award-winning Korlok Select range, Korlok Reserve is the newest rigid core collection from Karndean Designflooring. From the classic, yet rustic design of Vintage Oregon Oak sourced from the Pacific Northwest, to the sleek, matte grays of Tavern Oiled Oak, this collection of woods is an eclectic mix of rustic, limed and oiled visuals. Korlok Reserve is available in 48” x 7” planks with a 2G locking mechanism and 20mil wear layer. In addition to seeing and designing flooring differently, partners will see the positive impact of purchasing flooring differently, including stellar personalized service, quick order turnaround and low claims rates.